Simply put, Hydrostatic Testing involves filling a hose assembly with water and taking it to a pre-specified test pressure, generally 1.5 times the maximum working pressure and holding it for a set period of time. Whilst under pressure the hose is monitored and inspected to ensure that the pressure is held and its integrity is maintained. Buckley Industrial has developed one of the most advanced hydrostatic testing facilities available. 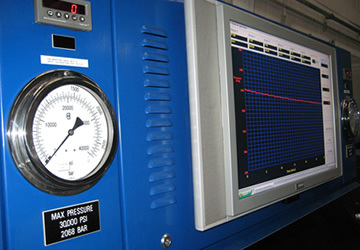 Our custom built test rigs, with highly sensitive computer aided tracking equipment, allows us to apply the exact test pressure for a set period of time and monitor any pressure drop. This enables even the smallest leak, not visible to the naked eye, to be detected. It is important not to over-pressurise as this may damage the integrity of the hose. All of our test rigs can be used with de-mineralised water thereby complying with the hose testing requirements of ISO10380, the international standard for metallic hose assemblies. Our facilities allow us to test hose assemblies up to 30,000 psi (2070 Bar). Testing is carried out in rubber lined troughs, clear of the floor, equipped with clear acrylic lids to meet safety standards yet still allow inspection under pressure.